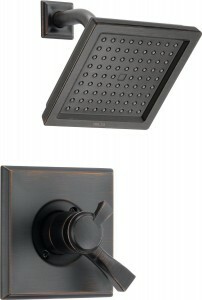 Delta T17251-RB Dryden Monitor 17 Series Shower Trim Venetian Bronze. The clean lines and dramatic geometric forms of the Dryden(TM) Bath Collection are based on style cues from the Art Deco period. Available in Chrome, Aged Pewter, Brilliance(R) Stainless or Venetian Bronze(R). Getting ready in the morning is far from routine when you are surrounded by a bath that reflects your personal style. The stylized square raincan showerhead provides a drenching, invigorating experience.